How do you cut through the noise, commotion, and bad information that is right now cluttering up your customers' digital space? One of the world's leading experts on content marketing, Joe Pulizzi explains how to attract prospects and customers by creating information and content they actually want to engage with. No longer can we interrupt our customers with mediocre content and sales messages they don't care about. 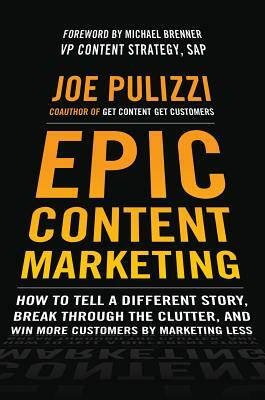 Epic Content Marketing takes you step-by-step through the process of developing stories that inform and entertain and compel customers to act--without actually telling them to. Epic content, distributed to the right person at the right time, is the way to truly capture the hearts and minds of customers. It's how to position your business as a trusted expert in its industry. It's what customers share and talk about. Once we hook customers with epic content, they reward us by sending our sales through the roof. With in-depth case studies of how John Deere, LEGO, Coca-Cola, and other leading corporations are using content to drive epic sales, this groundbreaking guide gives you all the tools to start creating and disseminating content that leads directly to greater profits and growth.